When Revealed: Reveal 1 encounter card for each quest card in play. Shadow: Defending player discards 1 attachment for each quest card in play. Card scans thanks to GeckoTH, Mr. Underhill, and the Lord of the Rings LCG Community. Quest map thanks to Ecthelion. Deck and card popularity data is kindly supplied by RingsDB. 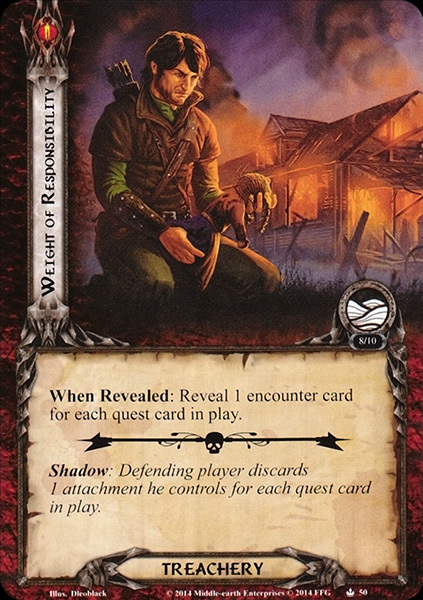 Scenario difficulty data is provided by The LotR LCG Quest Companion. This website is not produced, endorsed, supported, or affiliated with Fantasy Flight Games. The copyrightable portions of The Lord of the Rings: The Card Game and its expansions are © 2011 - 2019 Fantasy Flight Publishing, Inc. The Lord of the Rings, and the characters, items, events and places therein are trademarks or registered trademarks of The Saul Zaentz Company d/b/a Middle-earth Enterprises and are used, under license, by Fantasy Flight Games. Living Card Game, LCG, LCG logo and Fantasy Flight Supply are trademarks and/or registered trademarks of Fantasy Flight Publishing, Inc. All Rights Reserved to their respective owners.